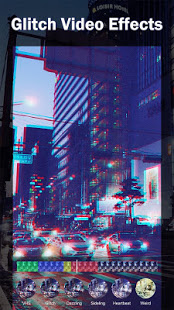 Hype up your stories with insanely cool glitch effects, Vaporwave effects, and VHS effects. Turn your video into a psychedelic or vaporwave modern digital aesthetic masterpieces. Record aesthetic and trippy videos with numerous powerful real-time video filters, ranging from RGB glitches, VHS, trippy, sketch, grainy, pixelated filters, to vaporwave effects. This is a wonderful app to help artists to create the most unique and perfect glitch and vaporwave retro videos. Just turn your phone into a vintage camcorder with glitch VHS effects! This is the easiest and best app to capture retro 3d vaporwave video effects and 3D effect photos. This 3d VHS glitch video editor app allows users to take videos as well as import from your gallery to create 3d glitch and VHS effects videos. Glitch video editor can export your videos to the gallery or share it to other apps like Instagram, Snapchat, Facebook, Twitter, etc.